When your machinists can’t find the tools they need, it means machine downtime—and your productivity takes a hit. Tools have a way of disappearing, temporarily or permanently, and it costs you money. Manually tracking tools, MRO and the industrial supplies you need—and keeping them organized in your tool crib—is a challenge, at best. The solution is an efficient, secure, automated tool crib management system from Tool-Krib Supply. We’ll help you dispense, track and manage everything from cutting tools to coolants, abrasives, and personal protection equipment—all the tools and supplies you use in metal manufacturing. Tool-Krib will assess your company’s requirements and design an efficient, secure tool-management solution that will safeguard your tool investment. A Tool-Krib solution starts with user-friendly software that tracks your tools and the workers using them. 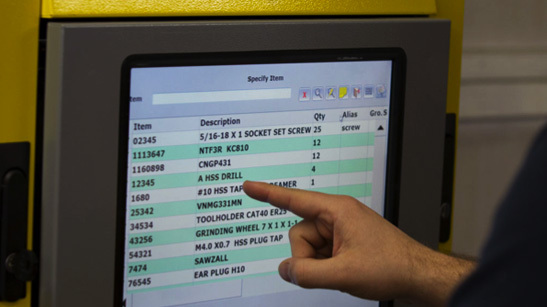 It includes electronically locked tool storage cabinets and/or industrial vending machines that issue and return your bar-coded tools, track the users, send tools out for repair, and sync up with your EDI procurement system. The tool crib management system we design for you might feature software and equipment from AutoCrib, Kennametal, SnapVend and/or other premier manufacturers. AutoCrib’s comprehensive approach to tool crib management combines industrial vending machines with software that optimizes your forecasting, automates your reordering process, simplifies accurate accounting, and increases productivity. AutoCrib’s innovative industrial vending machines and software will reduce your inventory expenditures and cut your costs of ordering, receiving, stocking, and maintaining inventory. Purpose-built for industrial use, AutoCrib’s vending machines dispense tools, cutting inserts, spare parts, MRO, gloves, PPE, fasteners, gages—whatever you need for your day-to-day operations—while capturing all the related data you require, including employee log-in, department, job number, customer number, and so forth. 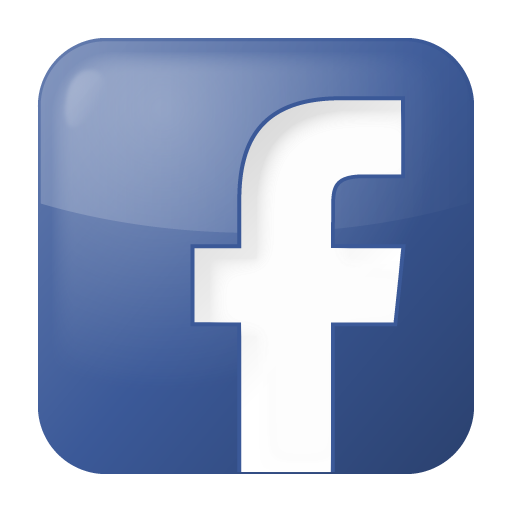 Tool vending machines that dispense and track tools, gages, inserts, cutting tools, fasteners, batteries, and more. Glove and PPE vending machines that provide secure, quick access to gloves and other high-volume soft goods. MRO vending and RFID portals for general MRO, large items, and plant maintenance supplies. Wireless scanners that give tool crib attendants maximum mobility. AutoCrib’s popular RoboCrib® line includes machines that can dispense 628 to 2,574 items with minimal floorspace requirements (10 to 27 square feet). You can access any item in less than 10 seconds. Customizable to fit your specific inventory items, these feature-rich industrial vending machines give you maximum control over tool and supply use—you can specify the tools available for each job, receive notice of excessive tool use on a particular job, limit employee access based on budget, department or other parameters, and more. Members of Tool-Krib’s sales staff are factory-trained and certified to service and repair all of the AutoCrib machines we sell. The Kennametal ToolBOSS™ system is a secure, electronically locked tool storage cabinet with 24-hour control of high-value items (e.g., carbide inserts, drills and taps). Combined with ToolBOSS™ Management software, the system controls the dispensing and replenishment of metalcutting tools and supplies. In addition, it gathers data on tool use and consumption to help you gain control of your tool investment and reduce your costs. ToolBOSS bays are configured with an array of drawer sizes, cupboards and lockers to accommodate tools of various shapes and sizes. Using a stylus on a computer touch-screen, a machinist selects the desired tool and swipes a barcoded ID to gain access to the tool. Each transaction is logged and time-stamped. The ToolBOSS system automatically unlocks the correct drawer for tool retrieval. The system can dispense reconditioned tools before issuing new ones, or prevent dispensing a tool until the user returns a previously issued tool. When inventory levels reach established minimums, the system will automatically reorder from selected vendors. One or more high-capacity ToolBOSS™ Modulo units that work with ToolBOSS software and offer an array of special features. ToolBOSS™ Roto-Point units that are designed to store a large number of different-size items where you’re tight on shop floor space—a single unit can be scaled from 36 to 468 spaces. The ToolBOSS™ ECTC (Journeyman) system, which works at the drawer level of an industry-standard cabinet, unlocking only a selected drawer while the others remain locked. The ToolBOSS™ LID with up to 324 compartments, which can be configured to your needs. Supply lockers for bulk storage and large items. For small to mid-sized shops, Tool-Krib can design an affordable SnapVend™ solution that employs the SnapVend Coil-style, or Helix, vending machine, as a standalone unit or combined with one or more SnapVend Lockers. These units will dispense and track MRO, PPE, and cutting tool supplies. Scan barcodes with equipment that’s matched to your needs. How it works: Employees scan their barcoded badges or enter their employee numbers, and then scan the barcode of the needed item. The system controls access, sets limits, issues reports, automatically reorders supplies as your pre-selected inventory minimums are reached, and issues inventory alerts with emails to any smart phone, tablet or computer. 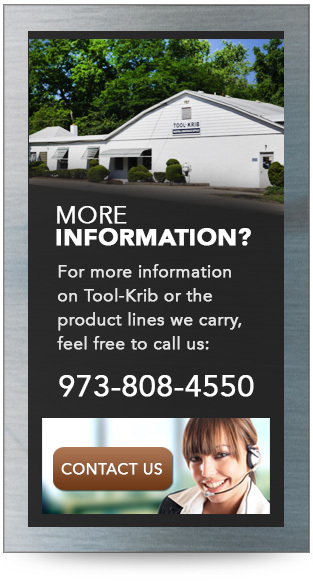 Contact us today to learn more about how Tool-Krib Supply can design a tool crib management solution that’s tailored to your specific requirements, whether your company is engaged in general machining, general engineering, or manufacturing for the aerospace and defense, medical, energy or automotive industries. Our expert sales force—whose members average 26 years in the business—is ready to work with you on an automated program to reduce tool consumption and increase productivity. In addition to tool crib management and industrial vending solutions, we can also customize an efficient vendor-managed inventory (VMI) solution that will streamline your procurement process from beginning to end.